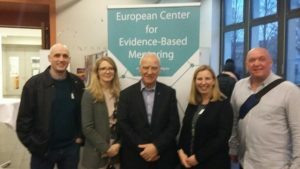 Susie White represented the intandem team at the biennial European Mentoring Summit in March, joining with colleagues from Scottish Government, Scottish Mentoring Networks, Befriending Networks and YMCA and learn how research is informing practice across Europe and America. There were four key note addresses, three interactive sessions (from a bewildering choice of 30) and one workshop (from a choice of 10). Mentoring in Scotland was positively recognised as leading the way in good practice and encouraging a quality approach to programmess. Jean Rhodes, a leading academic in the US mentoring landscape, emphasised that mentoring does not always work – programmes need to incorporate key elements to have an impact. Clara Peron stressed it’s never too late to begin measuring impact and the need for a plan to not only analyse but report and share a programme’s impact. Maurice Crul presented evidence of a programme’s impact on social and cognitive skills, particularly a mentee’s ability to know how to mobilise help. Volunteers: critical to make the best use of the scarce number of volunteer mentors – not everyone can be a mentor, some studies have shown that, for young people with signs of risk, committed volunteers with a background of helping are more likely to have a bigger impact. Training: A high degree of training and a sense of self-efficacy reduce the risk of relationships ending early and in an unplanned way. Clear goals: it’s not enough to have the relationship alone as the intervention, you need to be working on something to change the dynamics or behaviours. The relationship is the context for intervention and provides the space to help practice and master skills. Realistic expectations: A relationship that does not live up to expectations can do more harm than good, making a young person less likely to reach out to an adult for help. Providing training for mentees and parents/guardians as well as mentors helps everyone have realistic expectations for the relationship. If programmes offer specialised training to mentors, they have longer and stronger matches. Quality of relationships: the coordinator’s support and skill can improve the quality of relationships between matches. The quality of the relationship is most important factor in whether match will last and whether a mentor will stay on and encourage others. Alastair Wilson, University of Strathclyde, Miranda McIntosh, Scottish Government, Iain Forbes, Scottish Mnetoring Network, Susie White, intandem.